"I had never studied Italian before, but I have to say I was able to get a strong handle on the language within the first month." *Please note that this track is not available to Middlebury College students. The Middlebury School in Italy's Beginner track in Florence offers a unique opportunity to students who are new to the Italian language to approach its study in a more immersive context. The Language and Culture course will be taught in Italian so as to allow students not only to study the language, but to offer them an opportunity to use it in an enivronment that focuses on its acquisition. Area Studies courses will begin in English and increase toward more content in Italian as the semester progresses. Students will also take advantage of the Middlebury Language Pledge® to help jump-start their Italian language proficiency. In consultation with the Director of the program, students may also be given the option of choosing from courses taught in English at the Università degli Studi di Firenze or courses in studio art taught at the Accademia d'Arte Firenze. The Beginner track is designed for students with less than 1 year (2 semesters) of college-level Italian (or the equivalent). “The limits of my language means the limits of my world." The more we are able to speak a language the more we are able to not only communicate but to understand the culture that surrounds it. This beginner course is designed for students who are approaching the study of the Italian language for the first time. Studying in country means that as students acquire the language they will be able to immediately apply it and acquire a more in-depth knowledge of Italian culture and society. By using authentic and varied materials students will acquire the lexical, phonological and syntactical competences needed to communicate in language, as well as increase cross-cultural and intercultural competency. During the course, therefore, much importance is given to developing the students' ability to communicate in Italian. We will begin with simpler situations gradually arriving at more complex structures. The approach to grammar is functional to the context so that grammar becomes a tool for communication. For this reason, active participation in the classroom is very important both in individual and group work. The objective of the teaching method is to try to highlight the resources and capabilities of each student paying attention to the learning style of each one, because the teacher is not only the person that gives information and corrects errors, but is also a guide to discovering the new language, that must be felt as an encouraging challenge.Classes are conducted in Italian and take a functional approach to language learning with ample opportunity for oral practice. Students are not expected, at first, to understand every word but to attempt to grasp the key points and the overall meaning. This course will be dedicated to a survey of Italian cinema from the post-war period until today in the light of the representation of landscape in film, in the methodological frame of visual and cultural studies. Modern Italian cinema, that opens with Roberto Rossellini’s and Vittorio De Sica’s Neorealism in the post-war years and continues with Michelangelo Antonioni’s modernism, has deeply renovated filmic language, straying away from the narrative and stylistic patterns typical of Hollywood films and introducing a new kind of language, where the plot loses its centrality in favor of a freer gaze open to faces, things and spaces. The center of representation, therefore, becomes the landscape. 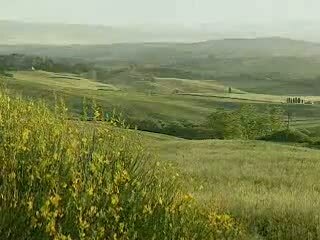 The locations where the characters move are no longer the mere background of a series of events, but become characters in themselves; now, the film doesn’t only tell men’s and women’s stories but interlaces patterns made of spaces – urban as well as rural – that become symbols of Italian history and culture. The first meetings will be dedicated to the post-war era, that sees on the silver screen the masterpieces signed by Roberto Rossellini (Paisà and Viaggio in Italia/Journey to Italy, set respectively in the frightened and vital Italy of 1945 and in the sunny and mysterious Naples of the Fifties) and Luchino Visconti (with the mythical Sicily of La terra trema/The Earth Trembles). We will explore then the decades to follow tracking the signs of the cities in their reflection on the big screen: Milan in the years of the economic miracle as seen by Michelangelo Antonioni (L’eclisse/The Eclipse), Rome and its peripheral neighborhoods as recounted by Pier Paolo Pasolini (and, years later, by Nanni Moretti), up to contemporary directors with their attempt at drawing a cartography of Italy today: the troubled South (Matteo Garrone, Alice Rohrwacher), the dark Florence of the horror film, the sleepy and ambiguous North of thrillers and noirs, the underground Genoa by Pietro Marcello. This course presents an in-depth study of Italian Renaissance Art through the direct analysis of the major architecture, sculpture and painting artworks from XIV to XVI century displayed in the florentine museums and churches. Its first objective is to provide the students with the capability to identify the most important artworks from the major florentine collections. Those artworks will not only be viewed in the respect of their stylistic characteritics but also in relation to their social religious, historical and political contest. The second course's objective is therefore to lead the students to read the artwork's connections with the subject, the artist's will and the commissioner's urgencies. Please note that the Beginner Track's Language & Culture course is taught in Italian. The more we are able to speak a language the more we are able to not only communicate but to understand the culture that surrounds it. This beginner course is designed for students who are approaching the study of the Italian language for the first time. Studying in country means that as students acquire the language they will be able to immediately apply it and acquire a more in depth knowledge of Italian culture and society . Through the use of authentic and varied materials students will acquire the lexical, phonological and syntactical competences needed to communicate in language, as well as increase cross-cultural and intercultural competency. During the course, therefore, much importance is given to developing the students' ability to communicate in Italian. We will begin with simpler situations gradually arriving at more complex structures. The approach to grammar is functional to the context so that grammar becomes a tool for communication. For this reason, active participation in the classroom is very important both in individual and group work. The objective of the teaching method is to try to highlight the resources and capabilities of each student paying attention to the learning style of each one, because the teacher is not only the person that gives information and corrects errors, but he/she is also a guide to discovering the new language, that must be felt as an encouraging challenge. Please note that instruction in the Beginner Track's content courses is given in English at the beginning of the semester and gradually progresses to instruction in Italian throughout the semester. This course investigates the Italian culture by exploring the most salient aspects of the country from different perspectives. We will start with a historical overview that helps make the intricate dynamics of the present more intelligible. Within a detailed examination of both domestic and foreign politics, significant attention will also paid to the country as a member state of the European Union. Topics to be addressed include economic realities such as the North-South divide and the current Youth unemployment crisis. The course will examine the student protest movement of the 1960s, known as the "Sessantotto", and the social explosions it provoked. We will move on to look at the Catholic Church and its influence on social behaviors as well as the current debate regarding bioethical issues and civil rights. Particular focus will be placed on the social changes that have affected the institution of the Family, the struggles of women for equal rights as well as their role in the society and gender relations. The course will also highlight the political, social and economic implications of organized crime on Italian society. Lastly, we will look at Italy’s transformation from a nation of emigrants to one of immigration and the key-role it plays in the ongoing Migrant emergency. The multidisciplinary approach to the study of Italy provides students with the tools needed to acquire a broad understanding of the cultural environment around them and thus to be deeply aware of the country's identity and complexity. Students are invited to reflect critically on how Italy’s culture has changed over time, to consider how far similar processes are at work in their own nation and to compare their own culture with the Italian one. This course will study the Italian Renaissance through the investigation of its architecture, sculpture and paintings between the 14th and 16th centuries. The opportunity to explore these works becomes a more exciting prospect when we consider that students will have the opportunity to visit the churches and museums that house the works and view everything first-hand. The first objective of the course will be dedicated to acquiring the skills to recognize the more prominent works that are present in the grand Florentine collections. The art will be analyzed and discussed not only on the basis of technique and style but also in relation to the social, religious, historical and political context that produced them. For this reason, the second objective of the course is to learn how to read in these masterpieces of the Renaissance the connection between the subject, the intention of the artist and the needs of those who commissioned these works.